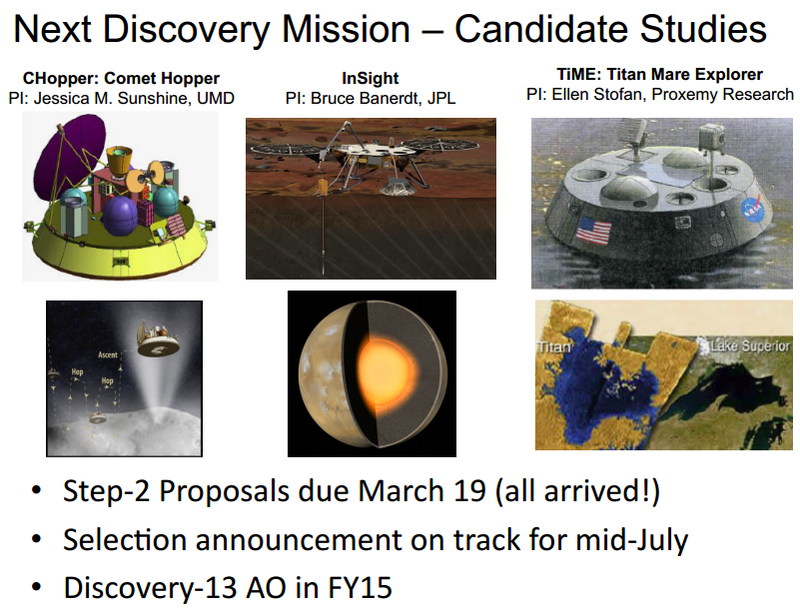 With the release of the official Announcement of Opportunity (AO) early in November, NASA has officially begun the competition to select its next low cost ($450M) Discovery program planetary mission. Because planetary scientists are free to propose missions to any destination in the solar system other than the sun and Earth, these competitions bring out the creativity in the planetary science program. Will we get a Venus orbiter? A return to the Mars polar regions? A comet lander? An orbiter around the exposed core of a protoplanet? Flybys of Jupiter’s moon Io? These are just the start of the list of missions likely to be proposed. Some Discovery missions, such as have taken planetary exploration to new locations such as to the asteroids Vesta and Ceres (Dawn) or been the first to orbit Mercury (MESSENGER). Other missions return to familiar worlds to explore a new facet in depth such as the interior of the moon (GRAIL) or Mars (InSight). The breadth of possibilities for these small missions is in contrast to that for NASA’s larger planetary missions. 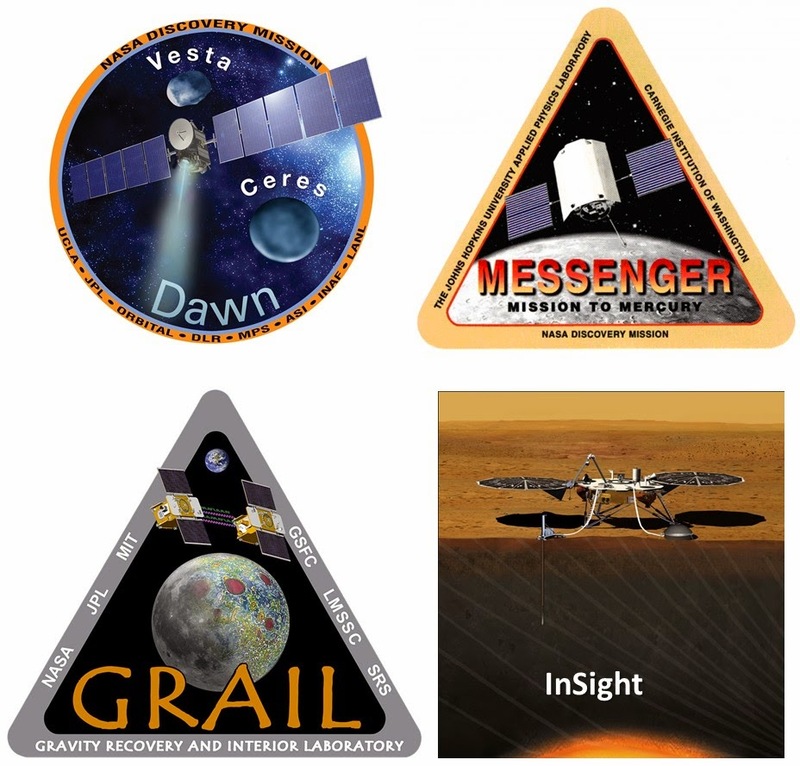 For its mid-cost ($700M to $800M) New Frontiers missions, scientists only can propose missions from a list of around five high priority missions identified once every ten years in the Decadal Survey. Targets for NASA’s largest missions (>$1.5B), the Flagships like Cassini at Saturn, also are chosen from an even shorter list approved in the Decadal Surveys. Practicalities will limit the ambitions of the Discovery proposals, though. Foremost among these is the tight cost cap, $450M. This is just a little more than half the funds available to New Frontiers missions such as the OSIRIS-REx asteroid sample return mission that is in development. The Discovery cost cap also is less than a fifth the cost of the Flagship Curiosity rover that is on Mars or a quarter the cost of the proposed Europa Clipper mission. Based on the NASA’s last competition, the planetary science community hasn’t run out of ideas. An informal tally of proposals (NASA doesn’t release information on proposals not selected as finalists) included seven Venus, three lunar, four Martian or Martian moon, eight asteroid, three comet, one Io, and two Titan proposals. (The previous competition had an option for a radioisotope power system that enabled several of the proposals.) Most teams don’t discuss their proposal ideas (this is a highly competitive business), but so far for this latest competition I’m aware of proposals for Venus missions, a Martian polar lander (IceBreaker), a spacecraft to study Mars’ two moons (PADME), and a mission to the asteroid Psyche that would explore the core of a protoplanet. Next June, NASA’s managers will announce a list of finalists for the current competition, and we will see which proposals the agency’s reviewers believe have the best combination of scientific merit and feasibility. These teams then will have approximately a year to prepare more detailed proposals (Phase A studies) followed by NASA’s announcement of the final winner in September 2016. The selected mission must launch by the end of 2021. During its first decade of this program, NASA’s Discovery program selected missions approximately every two years. The next decade saw just two missions selected as NASA’s budgets tightened and it had to pay for the development of other missions. Based on the latest proposed NASA budget (for Fiscal Year 2015, which has yet to be approved by Congress), NASA would return to selecting Discovery missions more frequently, perhaps every two to three years. The higher flight rate for Discovery missions would come at a cost, however. The NASA budget does not include proposed funding for additional New Frontiers missions, ruling out more challenging missions such as landing on Venus or returning samples from the moon or from a comet. As the list of these selected low cost missions has grown, many of the easiest and lowest cost ideas have already been flown. As a result, the complexity of missions has risen over time (see this blog post), making them more difficult to develop and fly within the cost cap. Several of the selected Discovery missions also suffered significant budget overruns, delaying the start of further new missions and subjecting NASA to Congressional criticisms (see this blog post). Perhaps as a result of more conservatively judging missions during their selection, cost overruns have become less common. 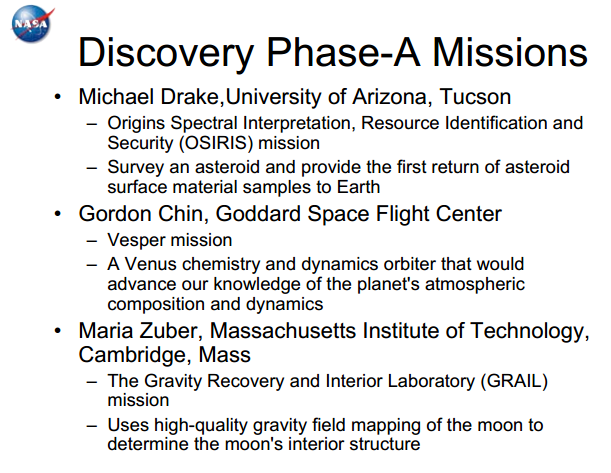 The list of finalist missions for the 2006 Discovery program selection that developed detailed, Phase A proposals. The GRAIL mission was selected, and the OSIRIS proposal was approved at the OSIRIS-REx New Frontiers mission. While Discovery spacecraft have traveled to many destinations, none have yet been selected for next-door Venus. The list of finalists for the 2012 Discovery program selection. The Mars InSight mission was selected. Both the CHopper and TIME missions required plutonium-238 power systems that are not available for the current competition. The total cost for the spacecraft, instruments, and data analysis are $450M. This figure is similar to that for the competitions that led to the selections of the lunar GRAIL and Martian InSight lander missions. NASA will cover the costs of a standard launch separately (missions that require non-standard launches will have to pay for the additional costs out of their $450M budget). In a key change from previous Discovery competitions, NASA will separately pay for the cost of mission operations outside of the $450M budget cap. Each year of flight typically entails operations costs of around $7-10M. A five year mission to Jupiter or to a hard-to-reach comet or asteroid automatically had a ~$50M penalty compared to missions to the moon, Venus, or Mars where flight times were measured in weeks or months. This change levels the playing field. Planetary missions are often done as collaborations between space agencies. To fit within the tight cost cap of Discovery missions, some prior missions have had a substantial portion of their scientific payload contributed by foreign scientists and paid for their governments. NASA’s managers want to support US scientists and have set the maximum foreign contribution to no more than one-third the total cost of the total mission and one-third of cost of the scientific instruments. 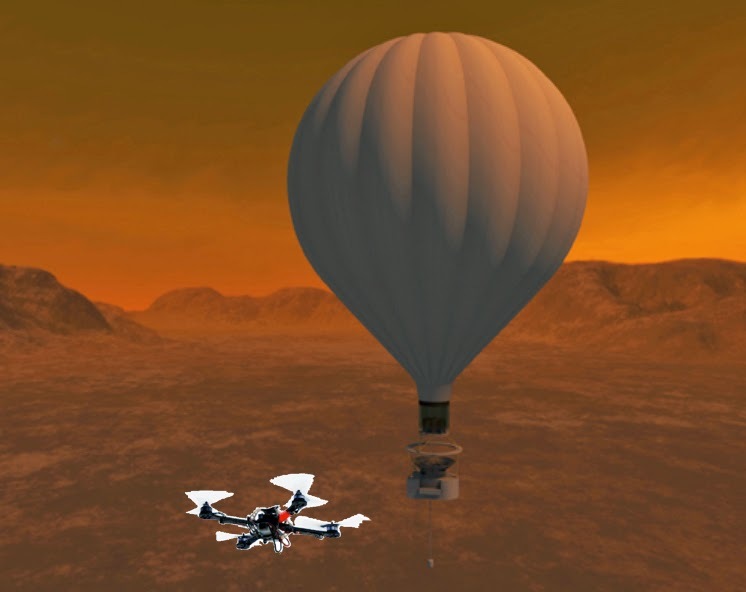 NASA has various new technologies that it would like to see demonstrated in a flight mission. It will, for example, increase the cost cap by $30M if the winning proposal uses NASA’s laser communications system, which can return far more data than radio systems. In a previous draft proposal for this Discovery competition, NASA previously had indicated that using this system might be mandatory. It is now optional. 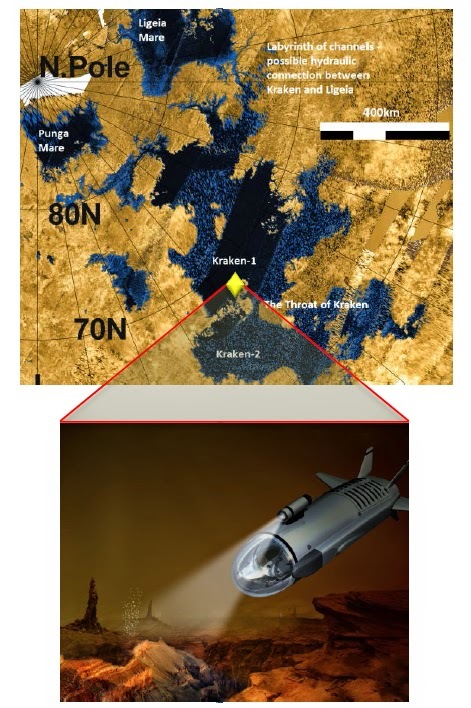 Presumably missions that would return vast amounts of data like a Venus radar mapper might use this option while a Venus atmospheric probe that would return only a small amount of data would not. When NASA announces the finalists for this competition next spring, we’ll see new examples the creativity of the scientific community has for exploring the solar system. After a couple of month hiatus from blogging on future planetary exploration (it's that day job), I wanted to return by casting a wider net than normal for topics. Today’s post accumulates a number of news items and ideas that together suggest how rich the coming decades of planetary exploration should be. I’m always looking for analogies that show how cheap planetary exploration really is when you look at the big picture. To each of us individually, $500 million, $1 billion, or $2 billion for a planetary mission feels like an almost unimaginable amount of money. (I’m assuming few billionaires are read this blog.) A better way is to look at these costs in the context of national economies. NASA’s budget for planetary exploration for 2014, for example, represents a trivial 0.008% of the US economy, or the equivalent of about $4 a year for a family earning $51,000 (the US median family income) a year. Okay, that was a bit dry, so let’s look at a more fun analogy. Vox.com reports that this year, Americans spent an estimated $350M on pet costumes for Halloween. If NASA had a similar amount each year to spend on its cheapest class of missions (the Discovery program that has funded missions to Mercury and the asteroids Vesta and Dawn among many destinations), it could develop six to seven of these missions a decade instead of the two it developed in the last decade. The past two months brought news of new planetary missions. India has announced that following the success of its Mars Orbiter Mission currently at the Red Planet, it will launch a follow up mission for 2018 after its second lunar mission to launch in 2016. Both the 2016 and 2018 missions will include a lander and rover. India’s neighbor China also is planning for an ambitious planetary program. After four successful missions to the moon, China has firm plans for at least one and possibly two lunar sample return missions this decade. China has also discussed plans for a Mars mission later this decade, but it appears that nation’s ambitions are much wider ranging. Chinese space scientists recently published a series of papers describing their priorities across the fields of space science. The suggested mission list for planetary exploration, broken into three stages, through 2030 is ambitious. China’s lunar missions have shown that its engineers have the discipline and ability to undertake an ambitious program. If China’s leaders desire, they could fund this program (as I said above, on a national scale planetary missions are affordable). I suspect, though, that this represents the priority list of Chinese scientists, much like the Decadal Survey represents the priority list of US scientists. If the willingness of Chinese politicians to fund planetary missions is similar to that of US politicians, perhaps a third or a half of these missions will see serious development by 2030. Even that fraction, though, would make China a leading player in planetary exploration. On this list, I’d most like to see the Ceres sample return. We already know that this asteroid is an rock-ice world different than any we've explored to date. I suspect that the Dawn spacecraft will show how intriguing this world is when it arrives in 2015. China’s lunar sample missions will fill a big hole that no other nation currently is addressing. China could fill a similar hole for Ceres, while all the other missions on the list are similar to those already planned by other space agencies (although at each world, there are always opportunities to explore from a new angle). A 150 kg is a lot to work with (although volumes will be constrained). I’m really intrigued to learn what creative ideas will be put forth. NASA expects to announce the winner this January. The Aviation Week and Space Technology magazine reports that NASA’s Jet Propulsion Laboratory (JPL) and the Aerospace Corporation are exploring a different concept, called MARSdrop, for piggy-back Mars spacecraft. The idea is take advantage of the wealth of spacecraft systems that have been developed for CubeSats that use tiny form factors (as small as 10x10x10 cm) for micro-satellites. In the Mars concept, one or more 10 kg spacecraft would be released from a spacecraft approaching Mars. Each MARSdrop spacecraft would include its own atmospheric entry system and a triangular parachute called a parawing to enable gliding to desired destinations. The landers would be small, perhaps 10 kg, and the first will cost $20M to 50M to develop. The scientific payload would be small, perhaps a video camera or multispectral imager, and the first lander would likely be battery powered, limiting its lifetime to a few days. The idea of small Mars missions seem to be trending, with a Canadian team proposing the Northern Lights mission. The small lander would come with its own instrument suite and arm and would also deploy a small rover that looks to be about the size of the Mars Pathfinder’s Sojourner rover. The program’s web site doesn’t mention any government funding – it appears that the team hopes to raise the few million dollars it believes it needs through crowd sourcing. To me, carrying seven instruments and a rover seems ambitious for first a private Mars mission. Just conducting a successful flight to Mars and then surviving landing (remember that the similar-sized British Beagle 2 lander failed that last test) to take a picture with the equivalent of a cellphone camera would be an outstanding feat. Technology has advanced to the point where micro Mars landers are conceivable; perhaps the Northern Lights team will be the ones to pull it off. Their website is worth a visit because I suspect that some team will put a lander of this scale on Mars in the next two decades. Each year, NASA solicits ideas for exploration technologies that would push well beyond existing technologies to enable missions that might fly in a decade or two. If these ideas can be made to work, the payback could be enormous (although only a few if any will make it all the way from inspiration to launch pad). This year’s list of funded concept studies was rich in ideas for planetary exploration, and the following paragraphs provide a sampling of the ones I found most intriguing. So that you can get a flavor of the boldness and creativity of these ideas, I’ll let the teams speak for themselves by quoting from their concept summaries. Exploration Architecture with Quantum Inertial Gravimetry and In Situ ChipSat Sensors – Sometimes a title that seems to border on technobabble hides an exciting idea, or in this case, three. The summary on NASA’s web site doesn't help much: “Through enabling technologies, such as high-accuracy quantum, or cold-atom, inertial sensors based on light-pulse atom interferometry (LPAI), and the extreme miniaturization of space components into fully functional spacecraft-on-a-chip systems (ChipSats), these combined missions can perform decadal-class science with greatly reduced time scales and risk.” Draper Lab’s media relations department, though, got the word out, and this idea received considerable press (see, for example, here and here). This concept has three parts. First, a CubeSat spacecraft that might be the size of a loaf of bread would be designed that would be capable of interplanetary flight and operations. Second, an extremely miniaturized accelerometer (that’s the “high-accuracy quantum, or cold-atom, inertial sensors”) would enable high resolution gravity measurements of a planet or moon. Third, a flock of tiny landers that are each a single computer chip would be released for surface studies. Draper Labs concept image and press released emphasized this concept as a way to explore Europa, which would probably be about the most difficult target imaginable: high radiation that kills electronics and little ability to add shielding to the tiny CubeSat or a ChipSats, no meaningful atmosphere to allow the ChipSats to flutter to the surface safely, and a distant sun that limits the effectiveness of solar panels. I will be interested to see if this team releases further information on how they would deal with these challenges. However, the same approach could also be used at Mars where the science potential is strong and the specific challenges of Europa’s environment are absent. For these technology development projects, teams sometimes will take on the most difficult challenge to help force creative solutions. Space limitations prevent me from summarizing all the solar system concepts selected for funding this year. There are also concepts for testing the ability of terrestrial plants to grow in a greenhouse on Mars, propel a spacecraft quickly into interstellar space, and precisely measure the gravity field and hence internal structure of asteroids and comets during brief flybys. You can read the summaries of these concepts and others addressing non-solar system exploration at this site. Three factors make exploring Europa hard. First, we want to explore an entire complex world, and mapping its features requires acquiring vast amounts of data. Second, Europa lies far from the Earth, which necessitates capable communications and power systems (read, “expensive”) to return the data to Earth. Third, Europa lies well within the harsh radiation fields surrounding Europa, which both requires significant radiation hardening (again, read, “expensive”) and limits the life of any spacecraft that explores this world. These factors can make a mission concept that seems like less actually be more. To get a sense of the challenges, compare the problems of exploring Mercury and Europa. A mission to Mercury must deal with the intense heat coming from both the sun and the planet surface. However, a spacecraft designed to overcome that challenge can continue to function until its fuel is exhausted. As a result of the luxury of spending years in orbit around Mercury and the fact that Earth is never more than 222 million miles away, NASA’s MESSENGER mission has been able to return terabytes of data to Earth. Between its orbital insertion in March 2011 and March 2012, the spacecraft generated 2.3 TB of data to be archived by NASA. The mission continues to operate today, so the total returned to date should be substantially more. The maximum data rate for this $446M (2008 dollars) mission is 104 kilobits per second. 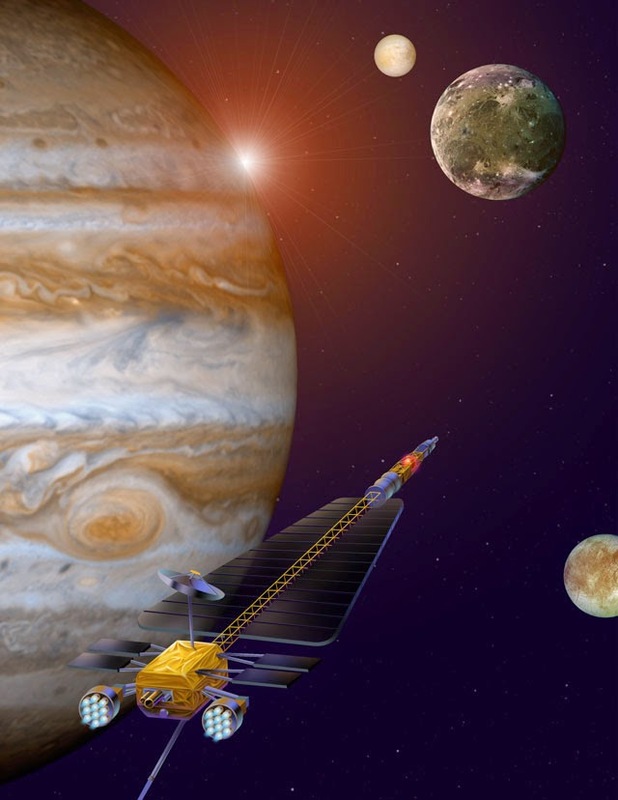 Immediately following the Galileo spacecraft’s discoveries, JPL conducted preliminary mission studies that envisioned a capable spacecraft using conventional technology to orbit Europa. In the late 1990’s, NASA’s then Administrator redirected efforts to a mission concept that would use yet-to-be-developed technologies (the X-2000 project) to dramatically lower mission costs to the neighborhood of MESSENGER’s cost. By the time the program was cancelled in 2002, mission estimates had shot from around $190M to $1.4B (early 2000’s dollars). Not to be outdone, the next NASA administrator proposed the Battlestar Galactica of missions, the Jupiter Icy Moons Orbiter (JIMO) that would orbit the moons Callisto and Ganymede in addition to Europa. This mission depended on the development of radically new capabilities such as space-rated nuclear fission reactors to power the spacecraft. This $16B concept died quietly when the administrator left NASA. NASA's concept for the Jupiter Icy Moons Orbiter. Credit: JPL/NASA. If the previous two efforts were perhaps fanciful, the next effort, the 2008 Jupiter Europa Orbiter (JEO) concept was based solidly on feasible technology. This highly capable spacecraft would have conducted extensive studies of the Jovian system before beginning nine months in orbit around Europa with a highly capable instrument suite. This was the mission any fan of Europa really wanted. Unfortunately, an estimated $4.7B price tag doomed the concept. Following the JEO studies, NASA conducted studies of three missions that each would have a firm cap of $2B: an orbiter, a multi-flyby spacecraft, and a lander. It was quickly realized that the latter would not be feasible until a previous mission had better studied Europa’s surface to find the best combinations of most scientifically while still safe landing sites. That left the choice of an orbiter that would spend 30 days circling the moon and a multi-flyby spacecraft that would spend less than a cumulative 6 days close to Europa during 34 flybys. 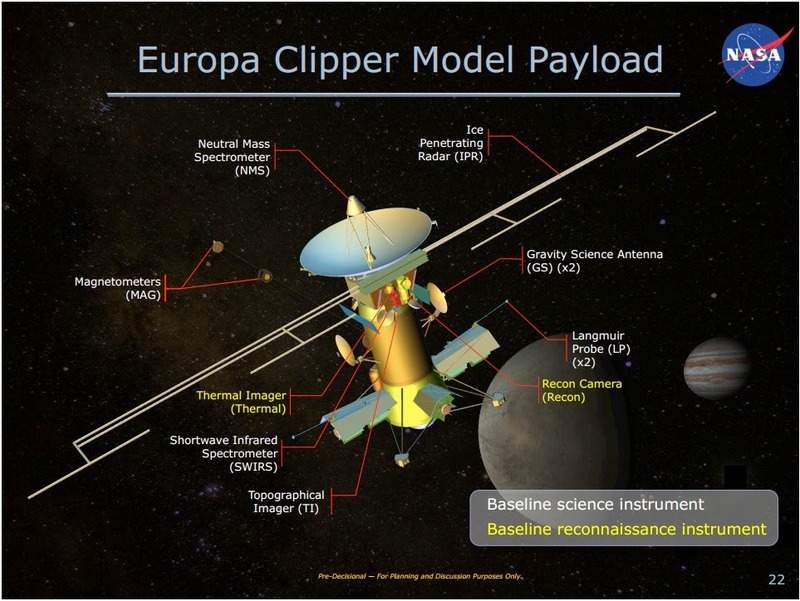 The scientists who reviewed the two missions solidly backed the multi-flyby concept (that has evolved into the current Europa Clipper concept). So how can 6 days of science be better than 30? For the comparison that follows, I’ll use the assumptions of the 2012 studies. Since that time, the capabilities of the multi-flyby concept have been substantially enhanced into the Europa Clipper concept. Because the orbiter concept didn’t have the additional two years of fine-tuning of the multi-flyby craft, comparing their 2012 conceptions allows comparison of equally developed concepts. The larger data return of the multi-flyby spacecraft would enable the spacecraft to carry two high priority instruments that generate large amounts of data. The more data hungry of these, the ice penetrating radar, would study the structure of the icy shell beneath the surface. This would allow scientists to study whether bodies of water are trapped within the ice between the surface and the ocean below and fracturing of the shell. The radar might penetrate through the shell to the top of the ocean to measure the total depth of the icy shell. These measurements will help scientists understand how material is transported between the ocean and the surface. The second instrument, a short-wave infrared spectrometer, can identify materials exposed on Europa’s surface and map their distribution. Scientists believe that Europa’s surface exposes materials transported from the ocean below, where we can easily see it and eventually study it with a lander. The interaction of materials on the surface with Jupiter’s radiation field creates chemicals that may be transported to the ocean below to be available for use by any life. 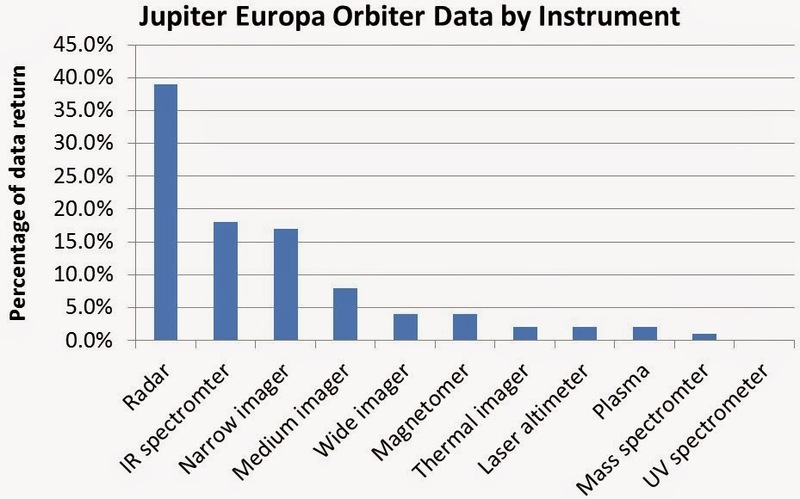 This spectrometer would map the presence and distribution of these materials across Europa’s globe. Both the 2012 orbiter and the multi-flyby spacecraft would carry a third data-hungry instrument, a topographic imager that would map the surface. The importance of the ice penetrating radar and mid-IR spectrometer tipped the weight of opinion in favor of the multi-flyby concept. Given a limited number of encounters that would fly over just a tiny fraction of Europa’s surface, they key was to distribute those flybys to fly over key locations. 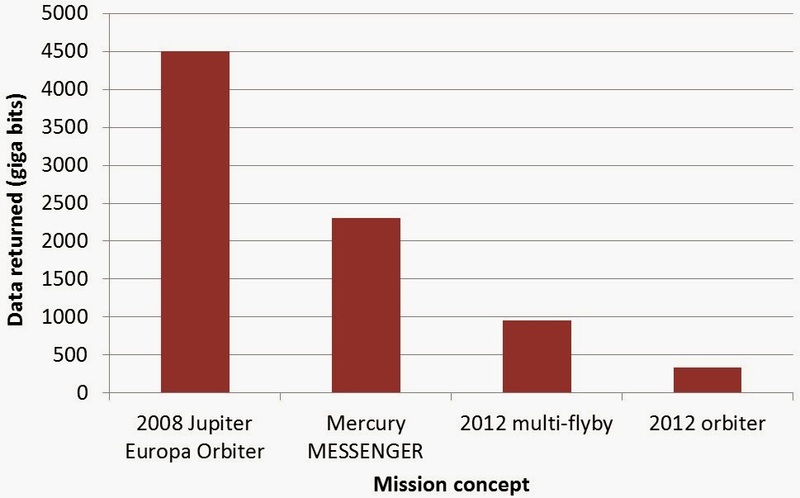 With two years of further study, the multi-flyby concept has evolved into the Europa Clipper concept has added an additional eleven flybys (for a total of 45) and several instruments compared to the 2012 concept. 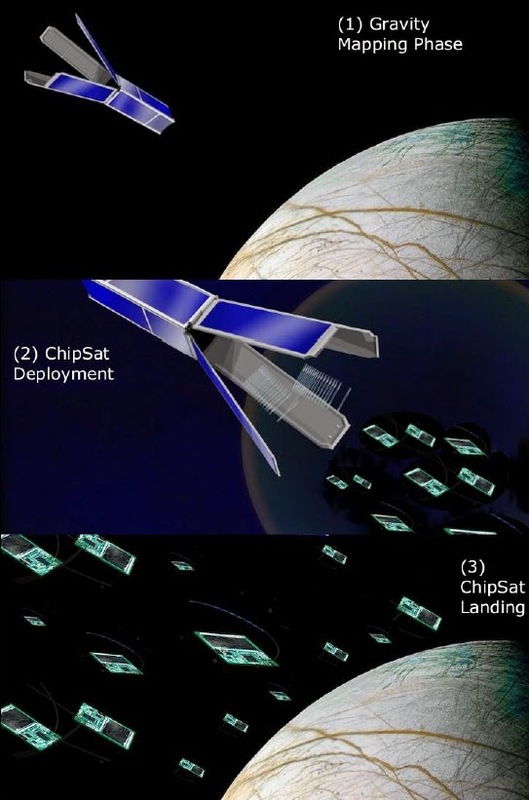 By balancing the placement and number of encounters with many months to return data, the Europa Clipper concept would enable a $2B mission that conducts the most crucial measurements of the $4.3B JEO concept. The $1.6B orbiter concept couldn’t match this feat. However, the Europa Clipper is not NASA’s plan for a Europa mission. White House budget analysts and NASA’s senior management are looking for a $1B concept that wouldn’t do the job of the Europa Clipper but would still do significant science. Earlier this summer, they reportedly received six proposals that target this cost cap. NASA ’s managers are examining the proposals to ensure that they are both fiscally and technically feasible within the budget. In the meantime, they are not releasing any information about the types of missions proposed. From what I understand, much of the scientific community and many NASA managers are skeptical that a meaningful mission can be done within a $1B budget. Sometime in the coming months we will learn whether NASA thinks any of the proposals have merit. If they do, then the broader scientific community will weigh in with its assessment. I’ve argued in a previous post that a $1B mission is likely technically possible, but I have doubts about whether it could address enough high priority science to be worth the expenditure. The coming months will see if I’m proved wrong or not. In the meantime, NASA continues to refine the Europa Clipper concept, which so far has shown the best balance between doing more with less to perform the critical science for the next step in exploring this world. Last week, NASA’s managers announced the selection of seven instruments for its 2020 Mars rover from a pool of 58 proposals submitted by teams of scientists. Reading through the capabilities of the instruments makes them seem like technology from science fiction, complete with lasers and x-rays. However, the types of instruments that weren’t selected say almost as much about the goals and expectations for the mission as those that were. This mission will be optimized for finding the best samples to return to Earth rather than carrying out the most sophisticated science that could have been sent to Mars. The Mars scientific community has collectively decided that the best and perhaps only way to answer these questions is to return carefully collected samples to Earth for study in terrestrial laboratories. The primary goal the science community laid out for the 2020 rover was to enable the efficient selection of the most compelling sample set possible – so compelling that Congress will spend the additional few billions of dollars for missions to retrieve and return them to Earth. To see how the instruments selected will work together towards this goal, imagine that you were sent to Mars and given the assignment to select a small set of samples to return to Earth. Because you can return only a few samples, you are under pressure to find those few special samples that can best reveal insights into the earliest history of Mars. The first thing you are likely to do is to look to see what types of terrain and rock formations surround you. The 2020 rover will carry two Mastcam-Z cameras for this task. These cameras were originally intended to fly on the Curiosity rover currently on Mars, but weren't completed in time. Unlike Curiosity’s cameras, these will have the ability to zoom from wide angle to moderate zoom (28 mm to 100 mm, 35 mm film equivalent) and to take movies. (If still photos from Mars are cool, imagine movies.) These cameras will take color images, but unlike our eyes they will also be able to take images in twelve carefully selected bands (“colors”) in the visible and near infrared spectrum to help map subtle distinctions in composition. The 2020 rover also will have the ability to assess the area around it in ways that our eyes never could. Like the Curiosity rover, the 2020 rover will zap rocks and soils with a laser to determine their composition. Curiosity’s ChemCam laser heats its targets sufficiently that a tiny amount vaporizes. The instrument analyzes the glow of the plasma cloud to measure the elements present. The 2020 rover will carry an advanced version of ChemCam called SuperCam that will use all three types of laser analysis to provide both elemental and mineralogical analysis. In addition, it will have capabilities for mapping composition using visible and infrared spectroscopy, although no details were provided (such as whether this capability will be just for the spots targeted by the lasers or will be full images of the scenes around the rover). The rocks and formations that Mastcam-Z and SuperCam can study, however, are only those at the surface. Geological formations often continue beneath the surface and the rocky outcrop in front of the rover may be the same or different than the outcrop viewed a hundred meters earlier in the rover’s drive. 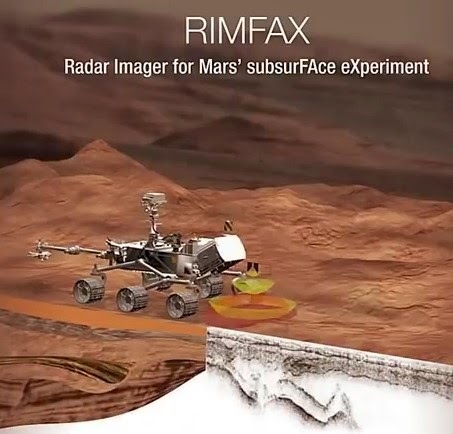 A Norwegian-supplied ground penetrating radar, RIMFAX, will map soil and rock layers up to a half kilometer below the surface with a resolution of 5 to 20 centimeters. 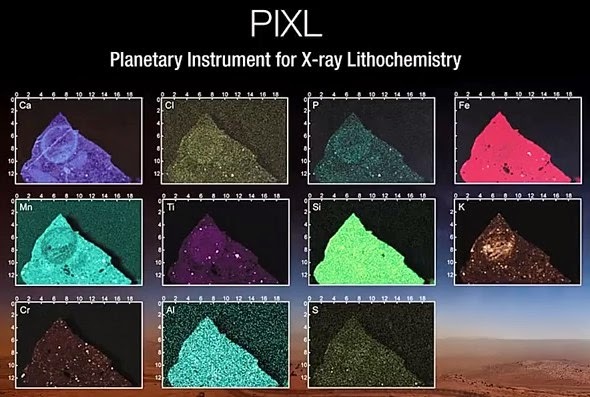 While Curiosity’s Alpha Particle-X-Ray spectrometer could measure only the average composition of the surface in front of it, both PIXL and SHERLOC will make hundreds to thousands of measurements across each surface. Each measurement point will be approximately the size of a grain of sand. The new capability to measure composition at near microscopic resolution will be revolutionary. If you look at soils and the interiors of most rocks, you’ll find that they are composed of many smaller rocks and inclusions. By taking many fine-scale measurements, each rock or patch of soil becomes a rich story of many rock fragments that together provide clues to their individual formation and that of their larger rock or soil type. SuperCam and SHERLOC’s laser spectroscopy will have an important capability that Curiosity lacks – they can easily identify and map the presence of organic materials. While many processes other than life can produce organic chemicals, life as we understand it requires a rich abundance of organic material. A key goal for the 2020 rover is to find biosignatures to indicate pre-biotic chemistry or life itself. By using lasers, the 2020 rover can find organics quickly and won’t be skunked by perchlorates, key advantages over Curiosity. 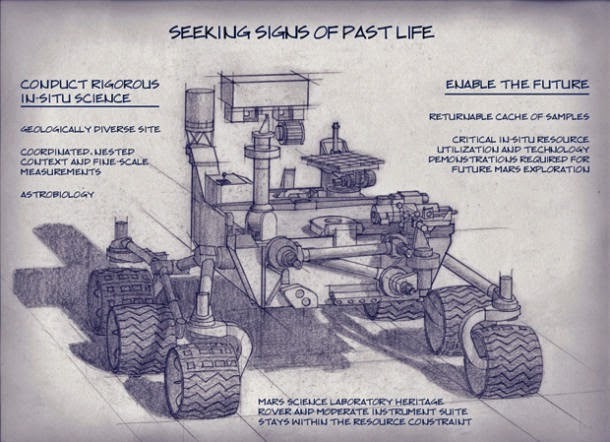 Two other instruments round out the 2020 rover’s manifest. The MEDA instrument, supplied by Spain, will monitor the weather and study the airborne dust. MOXIE will demonstrate the extraction of oxygen from the predominantly carbon dioxide atmosphere at Mars. Missions (manned or unmanned) that are to return to Earth could substantially reduce their launch weight if they could manufacture the oxidizer portion of their rocket fuel form the Martian air. The same applies to the oxygen supply to breath for any future astronauts. How does the 2020 rover’s scientific instrument suite (MOXIE is an engineering demonstration) compare to that of the Curiosity rovers? 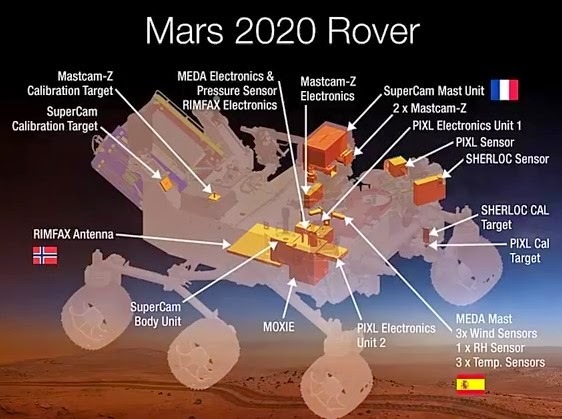 The 2020 rover will have far superior remote sensing instruments (Mastcam-Z, SuperCam, and RIMFAX) and contact instruments (PIXL and SHERLOC) than Curiosity. This will allow this new rover to much more quickly find important samples to study and potentially cache. This is especially true for finding any rich deposits of organic material. To locate two to three dozen samples within the mission’s lifetime on Mars, the 2020 rover will need to operate much more efficiently than the Curiosity rover has. The scientific team that defined the requirements that NASA used to select this instrument suite specifically asked for a suite of instruments simpler than Curiosity’s to speed operations. Because almost a decade has passed since Curiosity’s instruments were selected, the march of technology allows the new rover’s instruments to be considerably more capable than Curiosity’s. So what’s left off? Ignoring the miniature greenhouse and the solar-powered helicopter proposals (either likely would have been media sensations), the 2020 mission will not have the class of laboratory instruments included in the both Curiosity and the ExoMars 2018 payloads. Performing the most sensitive measurements requires larger instruments than can fit on the robotic arm. To address this, both the Curiosity and ExoMars rovers have instrument laboratories housed within their bodies. For example, the Curiosity and ExoMars mass spectrometers can identify the specific composition of organic molecules. This is useful to separate organics created from non-biotic processes from those created from possible biotic processes. The laser instruments to be carried by the 2020 rover will be limited to more general identification of the presence of broader groups of organic molecules. 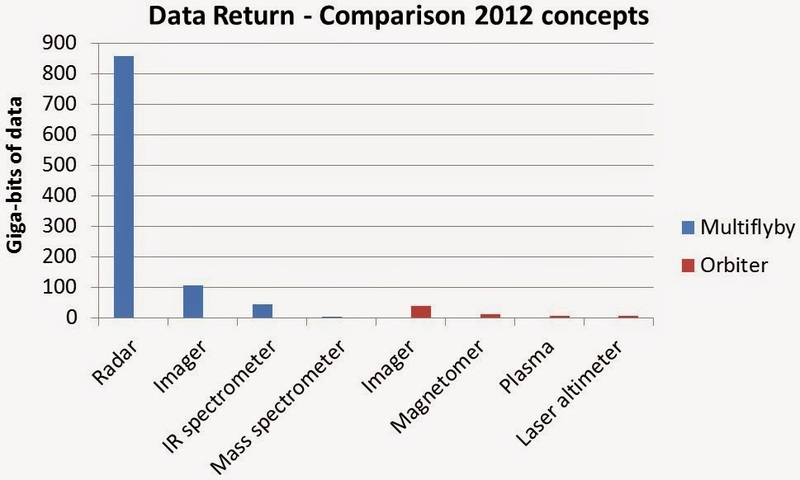 The mass spectrometer instruments proposed but not selected for the 2020 rover could have been more sensitive still than Curiosity and ExoMars’. The proposed CODEXinstrument, which would have had to be located as a laboratory instrument within the body of the rover, would have used lasers to vaporize minute quantities of material across the sample to be fed into a mass spectrometer. (By vaporizing samples, the instrument would have avoided the perchlorate problem.) The resulting measurements would have provided detailed maps of the chemistry of samples, the types of organics within it, and the age of the rock from which it came. Achieving both of the latter goals have been two of the justifications for returning samples to Earth. CODEX would have made progress towards both on Mars, although measurements made in terrestrial laboratories would be much more precise. The instruments will be half of the 2020 rover’s payload. Still to come are details on the sample collection and caching system. Based on work done to date, it appears that the rover will collect and store two to three dozen sample cores that each will be about as wide as a pencil and about half as long as a new one. The 2020 rover will carry an instrument suite optimized for efficiently finding the best sample suite at its landing site for a possible return to Earth. If those samples do make it to our world, we likely will have a revolution in our understanding of the Red Planet. If they do not, the scientific community may come to wish they had asked for a more capable instrument complement to do more sophisticated science on Mars. But life is about choices, and NASA and the scientific community have bet that the samples collected will be so compelling that funds will be made available for their return to Earth. Either way, the instruments of the 2020 rover will be marvels much more advanced than their counterparts on Curiosity. We will get great science.